Photo: Fire Service and Civil Defence rescuers at the spot beside the damaged vehicle in Noakhali on Friday, Feb 8, 2019. 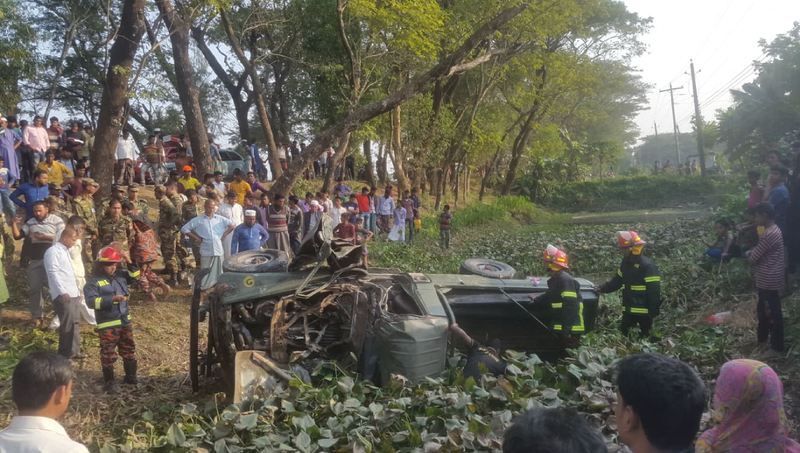 Noakhali, Feb 8 : Three army personnel were killed and nine others injured in a road accident in Subarnachar upazila here on Friday afternoon. The deceased were identified as sepoys Mamun, Foyez and Firoz of the Engineer Corp-21 of Jalalabad Cantonment in Sylhet. Md Shahed Uddin, officer in-charge of Char Jabbar Police Station, said a motorcade of the army men from Jalalabad Cantonment was going to the Swarna Dwip in the upazila for winter parade. As the motorcade reached Totarbazar, one of the vehicles skidded off the road and plunged into a roadside ditch, killing the trio on the spot and injuring nine other army men. On information, members of Fire Service and Civil Defence rushed in and conducted the rescue operation with the help of locals and army personnel. The injured were first taken to the upazila health complex and later airlifted to the Combined Military Hospital in Dhaka, the OC said.